Haplodiploidy and relatedness in bumblebees. All social bees, wasps and ants - which I will refer to as just bees from now on - have workers that do not go on to produce offspring, but help their sexual sisters and brothers to produce offspring. Now this altruistic behaviour does not seem to make any sense, and it did cause Charles Darwin a lot of worry, so you are in good company if it confuses you too. However we tend to think of things from a human perspective, and there are major differences between us and bees that go some way to making sense of the seemingly selfless behaviour of the workers. Quite simply a bee worker shares 75% of her genes with her sisters. Whereas we share only 50% of our genes with out brothers or sisters. And the reason for this difference is that we are diploid animals and bees are haplodiploid animals. Confused? Well let me try to explain. In diploid animals both the male and female have two sets of chromosomes; the female egg contains one of the two sets and the male sperm contains one of his two sets. So when fertilisation occurs the fertilised egg again contains two sets of chromosomes; half from the male and half from the female. So the average degree of relatedness between sisters and brothers is 50%. Humans are diploid. In haplodiploid animals the male has only one set of chromosomes as he develops from an unfertilised egg, so every sperm contains the same one set of chromosomes, in other words he passes on 100% of his genes in each sperm. The female however is diploid so has two sets of chromosomes, and each egg will contain one of these two sets. As males develop from unfertilised eggs this means that sons will have 100% for their genes in common with the female, and in bees this will be the queen. This also means that male bumblebees have no father as they do not receive any genes from him at all. . Also the queen passed on only half her genes to her son so she is related to him by just 50%. So to recap all males are related to the queen 100%. All males are fatherless. All queens are related to their sons 50%. The workers (females) will also have received one set of the possible two of the queen's chromosomes so they will be 50% related to her, and they will also have received the one set that their father had. And because the male (father) had just one set of chromosomes to pass on he is 100% related to his daughters. 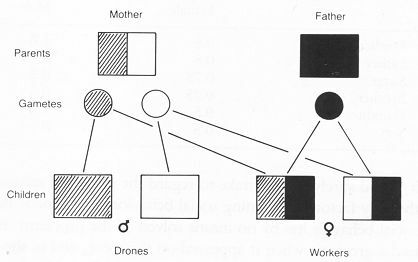 The diagram below shows how males (drones) grow from unfertilised eggs getting all their genes from the queen, their mother; whereas females (workers and queens) get genes from both father and mother as they grow from fertilised eggs. This makes females (queens and workers) 50% related to their queen and 50% related to their father. And fathers 100% related to their daughters. Now the difficult bit, the relatedness between sisters. Each sister receives one of a possible two sets of chromosomes from the queen, and these make up half her genes, so there is a 50% chance that 50% of her genes will be the same as her sister's. So that's 50% x 50% = 25%, or 1/2 x 1/2 = 1/4. Then both sisters get the same set of genes from the male (their father) as he has only one set. So half their genes are exactly the same, and if you add this half to the 25% from the queen you get a relatedness of 75% between sisters. This means that sisters (workers) are more related to each other than they are to their mother (queen), father or even any daughters they could have. So if a worker wants to pass on her genes it makes sense for her to pass them on through sisters who will be raised as queens as they will have 75% of her genes. If a worker did have daughters they would get just 50 % of her genes. So, should a worker also be better to raise her brothers to pass on her genes rather than having sons of her own. Well the answer to this is no. All her brothers are just 25% related to her - they are in effect half brothers as they had no father. They have just one set of their mother's chromosomes, so there is a 50% chance that they will share 50% of their sister's genes - 25%. This means that if the worker lays her own unfertilized (male) eggs they will be 50% related to her as they will have one of her 2 sets of chromosomes. It is this that leads to the chaos and breakdown of harmony in a bumblebee nest towards the end of summer. However there is one major assumption here and that is that the queen mates with only one male, and we know that this is rarely the case in honeybees, and probably not in some of the other social insects.